Lotta Ahlberg (Sweden, Project Manager City of Helsingborg, IT and Digitization Department) and Max Lennartsson (Sweden, Digital project manager, City of Helsingborg, Department of culture affairs, Marketing and communication) presented „Lessons Learned with the App ‘Guide Helsingborg’ and other digital projects in Helsingborg”. Lotta and Max have been highly involved in developing Guide Helsingborg, an app that unites various attractions among them several museums in Helsingborg. The digitization efforts of the City were presented at 2018 Baltic Sea Tourism Forum in Riga, with an impressive progress in both agile ways of working and digital services. 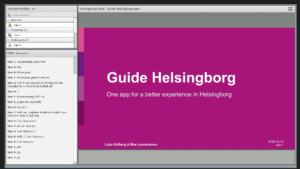 Lotta and Max shared their insights in developing Guide Helsingborg. The app was developed in agile approach, involving 5 different departments of Helsingborg City, who jointly drive the continuous development of the app. Editors from various institutions set up different tours, around 25 are available at this point. The project follows an open source strategy, the app‘s code is available via github for the further use of other cities. Lotta recommends to take small steps and to continuously test with the user. „We are not afraid of making mistakes. If something doesn’t work, we just go back and start over“, she explains. This attitude and the development of small chunks involving all stakeholders has helped the app become a success. Ten-thousand downloads to date and happy users as well as editors. In addition, the app development is considered a process, out of several little projects. Continuously new tours are provided and also new functionalities are developed. 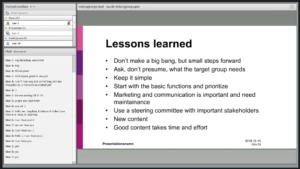 Watch the recording of the BalticMuseums Xchange webinar with Lotta and Max from Helsingborg, learning about their approach and their lessons learned in this digital project. The BalticMuseums team will stay in touch to exchange further experiences and code.